MOSCOW, March 25. /TASS/. The Novichok nerve gas formula was published in the United States as far back as 1998, a high-ranking Russian defense ministry official said on Sunday. "As far back as 1998, we looked though a regular edition of the spectral database released by the US National Bureau of Standards, which has spectral data on about 300,000 compounds and is regularly updated, to find an agent that caught our attention as it was an organophosphorate chemical. We understood that it must have a lethal effect. Now it has turned out that, judging by the name of that agent, it was Novichok A234. It has surfaced," Igor Rybalchenko, chief of the ministry’s chemical laboratory, said in an interview with the Voskresny Vecher news roundup on the Rossiya-1 television channel. On March 4, former Russian military intelligence officer Sergei Skripal and his daughter Yulia were found unconscious on a bench near the Maltings shopping center in Salisbury. Police said they had been exposed to a nerve agent. Both are in the hospital in a critical condition. The UK accused Russia of being involved, but failed to produce any evidence. UK Prime Minister Theresa May on March 14 accused Russia of "unlawful use of force" against her country. 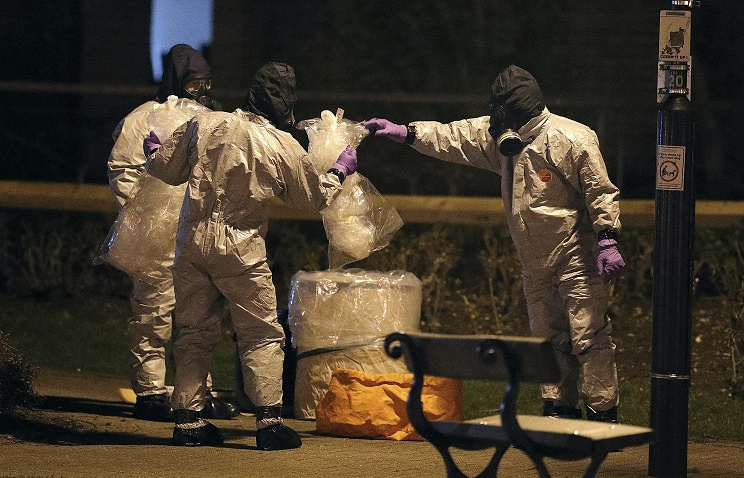 She identified the substance used in the attack as a Novichok nerve agent, developed in the former Soviet Union. She said that 23 Russian diplomats would be expelled from the country within one week and that all planned high-level bilateral contacts had been suspended. Russia has rejected all of the United Kingdom’s accusations. On March 17, the Russian Foreign Ministry said that in response to the UK’s steps, 23 British diplomats would be expelled within a week. In addition, Britain’s consulate in St. Petersburg would be closed and the British Council’s operations in Russia would be terminated. Furthermore, Moscow pointed out that further measures could be taken "should there be any more hostile actions against Russia. ".